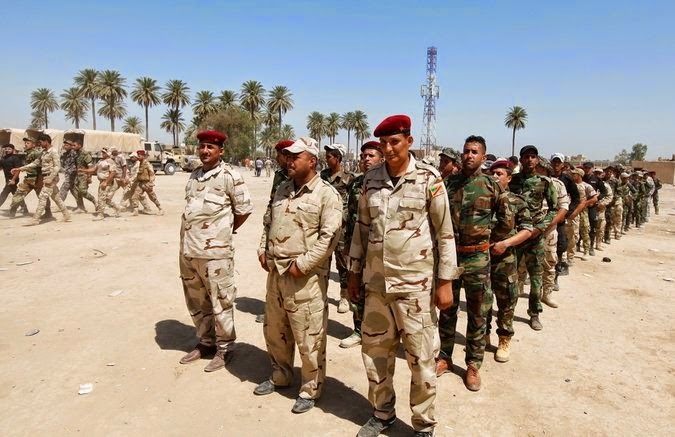 The New York Times reported today that a classified assessment of Iraq’s security forces concludes that many units are so deeply infiltrated by either Sunni extremist informants or Shiite personnel backed by Iran that any Americans assigned to advise ISF units could face risks to their safety. The assessment also concludes that only half of ISF operational units are capable enough for U.S. special forces to advise them. The assessment states that Iraqi forces loyal to Prime Minister Nuri al-Maliki are now heavily dependent on Shiite militias — many of which were trained in Iran — as well as on advisers from Iran’s Quds Force. The assessment, which took two weeks to prepare under the guidance of Army Major General Dana Pittard, graded the strengths and weaknesses of units down to the brigade level, examining their equipment, ammunition, sectarian makeup, morale, leadership and other indicators. Each unit’s overall capability was rendered in a blunt color-coded chart: green if capable; red if not, the New York Times reported. One of the assessment’s conclusions was that Iraqi forces had the ability to defend Baghdad, but not necessary hold all of it, especially against a major attack by the Islamic State fighters. The assessment does not contain specific recommendations. Those will be developed separately by the United States Central Command and the Joint Staff and will be sent to the secretary of defense and the White House. "General Dempsey has signaled, however, that airstrikes are still an option." "In an interview with National Public Radio on June 27, General Dempsey ticked off three potential aims: targeting “high-value individuals who are the leadership” of ISIS; protecting critical infrastructure, like dams; and “blunting attacks by massed” ISIS forces — a possible assault on Baghdad, for instance." COMMENTARY: These are not war winning goals. Only the defensive goals of protecting Baghdad against massed IS forces suggests the use of JTACs for CAS missions. The other goals appear more in line with CT.
the US doesn't feel any urgency in helping to maintain Maliki in power. when and if Iraq selects a government less dedicated to Shi'a supremacy and less heavily influenced by Iranian theocratic expansionism the US will be more forthcoming. until then, the US will allow Iran to expend blood and treasure to prop up Maliki and to maintain their own interests. the US might benefit from watching Iranians expend their resources and might even feel that the US owes it to their own armed forces to see that Iranian soldiers bleed in Iraq.